Quite familiar with accepting credit and debit card payments, and the profitability challenges from credit card chargebacks, experienced ecommerce merchants know that chargebacks and disputes must be dealt with and resolved — whether that feels fair or not. What’s a chargeback, you ask? If that’s the question springing to mind after the first paragraph, you must be new to — or just now be contemplating — accepting payment card transactions for a new ecommerce business. Do yourself a favor and learn more… The ins and outs of payment processing can sometimes appear murky to those not in the industry. Credit card disputes arising from chargebacks fall into that category. A lot of ecommerce industry real estate is cultivated with chargeback material, from the basics, to how to prevent chargebacks, and credit card companies’ dispute processes. For background, see multiple entries in our FAQ pages and this post on how to prevent them. In a nutshell, chargebacks occur when a cardholder or an issuing bank challenges a credit card charge. Causes can include suspected fraudulent activity — lost or damaged goods — or because a customer returned merchandise and hasn’t yet received a refund. If a merchant pushes back, the chargeback turns into a dispute. Thus the credit card disputes process is about resolving chargeback disagreements between cardholders and merchants. Why should you care? Because chargebacks cost merchants both time and money. Too many can cause merchant account termination. Best all around to learn more, manage your chargeback level proactively, and stay afloat. Note that the chargeback process and related credit card disputes processes were created by the major card brands to protect consumers. The Truth in Lending Act and the Fair Credit Billing Act regulate these processes, which favor the consumer as a default. After tinkering with their chargeback rules for years, Visa has now undertaken substantial changes to its credit card disputes process. Visa marketing materials suggest they’ve made significant changes to chargeback rules over the years in search of global consistency. Now they’re in the midst of a new initiative, Visa Claims Resolution (VCR). Announced initially for October 2017 delivery, Visa recently deferred delivery to April 2018. Now VCR implementation coincides with the April VisaNet “release weekend” system upgrades. The VCR initiative tagline reads, “Efficient Dispute Processing for Merchants.” The stated goal is to improve the efficiency of handling chargebacks by shortening and simplifying the credit card disputes resolution process. Merchants applaud the goal. Introduce a new quality check on first chargebacks. Visa estimates that 14% of first chargebacks merchants receive are invalid. Those will be automatically eliminated. Visa’s VCR flow standardizes on transaction data housed in Visa databases. The plan is to associate higher quality and more complete transaction information with all disputes. Reduce the current 22 dispute Reason Codes by consolidating them into 4 dispute Categories. Each dispute will be categorized as Fraud, Authorization, Processing Errors, or Consumer Dispute. Disputes that don’t meet criteria required for one of those categories will be identified and blocked automatically. For Fraud and Authorization disputes, Visa’s system will automatically assign liability to either the Financial Institution or the Merchant, through a process Visa labeled Allocation. The process for handling disputes related to Processing Errors and Consumer Disputes will remain similar to the current system. VCR refers to this as Collaboration. The final key element is to shorten response timeframes leading to the faster resolution of credit card disputes. 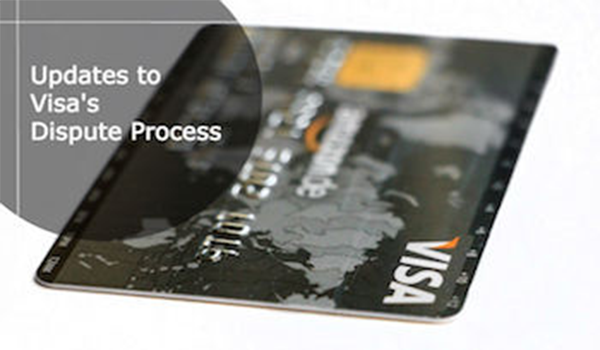 At the same time, Visa promises to keep pace with other needs of the payments industry. You can hear it from the horse’s mouth and find a simple process flow diagram and more details on usa.Visa.com. You might also find useful the commentary from Monica Eaton-Cardone, a founder and the COO of Chargebacks911. It certainly behooves all ecommerce merchants to know what’s coming. Credit card disputes should be avoided when possible, and dealt with proactively when they occur. Here’s a tip for Merchants: stay in the drivers’ seat… issue a refund quickly, before a chargeback becomes a dispute. It helps to work with a processor who’s an industry expert. They’ll offer many tips like that on how to handle credit card disputes as well as assistance with chargeback management. They’ll also work with you to identify how Visa’s VCR initiative (now renamed to Enhanced Data Resolution Process — EDRP) will change your existing credit card disputes process, and also any dispute tools updates you may require. After all, your industry expert processor should help you navigate through whatever comes your way in the world of payments.